Sarah dropped me off at the start of the Provo River 10 miler in the South Fork of the Provo Canyon. She and the kids when sledding. I warmed up 2 miles, and then started the tempo workout. First, 3.22 miles down from the 10 miler starting line to the Vivian park. Cold, headwind, hard to get going - 17:40. The road was good as always - they plow it very well. Then a bit over 2 miles treading through the snow to Nunns Park, and another 3 mile tempo to the mouth of the Provo Canyon. Snow in the first half-mile, then mostly dry. Hard to get going with cold feet. Started out at 6:00 pace - all I could do on that snow. Finally was able to shift gears and get going. Last mile in 5:20 for the total of 16:32 for 3 miles. Quads were cramping up a bit while I was trying to shift gears. Now cooldown to Borders at Riverwoods where Sarah was going to pick me up. But I wanted to see how fast I could go with warm feet, and decided to run a half-mile at a tempo pace. Now feeling much better - 2:37. Additionally did the "always on the run miles", and ran with Benjamin and Jennifer. Easy run in the morning with Eric and George. Eric just returned from Italy where he saw the Olypimpics and visited the people he taught there 25 years ago while serving a mission. He found them still very active in the Church and working hard to build the Lord's kingdom. Then we dropped Eric off and it was time for George's tempo run. We did the Slate Canyon Loop (2.11 miles) in 15:29. This was a little bit slower than a week ago, but it was colder today. Total of 10 miles in the morning. Throughout the day I did my "always on the run" miles, and ran with Benjamin and Jenny. Speedwork day. 12x400 with 200 jog recovery in the Provo Canyon downhill. Fairly strong headwind. Averaged 69.4. When the wind was strong, some were as slow as 70.7. When it weakened, started breaking 69. On the last one hit the first 200 in 35 with headwind, then it weakened, and I started moving my legs as fast as I could visualizing the end of a race and an imaginary competitor I was trying to outkick. To my surprise, 67.3 with 32 seconds for the second half. Two weeks ago I averaged 67.0, but that was with tailwind. Additionally, my regular "always on the run" miles, and a run with Benjamin and Jennifer to reach the daily goal of 13 miles. Easy run with Eric and George. Motivated by his latest trip, Eric is brushing up his Italian. He served a mission in Italy a while ago and spoke it well then, but it's been 25 years. We did some 400 m accelerations in the middle - 1:27, 1:24, 1:21 (downhill), 1:18 (downhill), and 1:21. Eric did the first two and then we dropped him off, George did all. I am curious to see what will give George a breakthrough. The total length of the morning run was 10 miles. As usual, I added on some "always on the run" running, and ran with Benjamin and Jenny. Tomorrow is a race. 15 K in the Salt Lake Track Club Winter Series. So today is my taper day. Ran easy 6 miles with George in the morning, with the exception of a tune-up 0.5 mile (flat) at what I perceived to be a 15 K pace effort. Hit it in 2:40. Later during the day, ran with Benjamin and Jenny + "always on the run", which makes the total for the day 8 miles. Salt Lake Track Club 15 K. 51:13, 3rd place. Steve Ashbaker and I had a plan to go out at 5:30 pace and alternate leads every 2 minutes until the 10 K mark, then get into a race. We made it through the first 1 K in 3:19, then 5:23 for the mile, 6:40 at the 2 K, 10:04 at 3 K. It was my turn to lead. By that time only Alexander Thomas was ahead of us, and he was close enough to make it tempting to catch him. I picked it up a bit, and pulled up hoping that both of us could draft for while instead of trading leads. I also had secret hopes to sustain 5:20 pace for the whole race. Unfortunately Steve was not feeling that great, and the little surge dropped him. I tried to follow Alexander, but he picked up the pace shortly after I caught him and lost me for good. Additionally, it seems like my cardiovascular system was working better than my legs - a pick up to sub 5:20 pace even for a short while caused a cramp in the quads. This has happened before. Well, I'll have to figure out how to fix this. 2 miles in 10:44, 4 K in 13:23, 3 miles 16:19, 5 K 16:56. Shortly before mile 4 I hear "good job, guys" from an aid station. That means there is somebody else catching me. 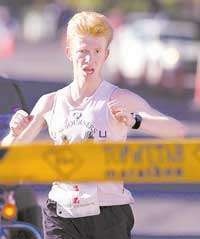 I've heard this before, too, and at a very bad place - 0.75 miles away from the finish of the Ogden Marathon last year. Paul Peterson was the $250 that ran past me to take third. That was alright though and I suppose I deserved it - I've done nasty things to him before. I have been the $250 that went past him at mile 22, $1000 that ran away from the start after staying the night at his house, and $1000 that took off at the half-marathon mark. Paul is a great guy and we are good friends. Has Steve regrouped after the surge? No it is Mike Kirk, and he is having a very good day. I try to go with him, and for a while it looks like I can handle it. 4 miles in 21:48, turnaround in 25:30, supposedly 5 miles in 27:09, supposedly 6 miles in 33:02, 10 K in 34:05. Mike has dropped me shortly after 5 miles, and is gradually pulling away. I try to hold my ground, but he is doing better. If only I could relax my quads a bit... 12 K in 40:59. I am trying to stay as close as possible to the 5:30 pace. 13 K in 44:24. Now try to get close to 5:20 for the last mile. 14 K in 47:52. I shift gears after mile 9 for the kick, and manage 3:21 for the last 1 K to finish in 51:13. 50:40 for Mike, 49:27 for Alexander Thomas. Steve finishes a disappointing 7th in 52:38. But I am sure he will soon have a much better race. This one was a fluke for him. With the warm up, cooldown, and the "always on the run" miles, and the kids runs, total mileage for the day is 15.